In Italian, "Primo" means the best. We chose that name because a Primo Ceramic Grill offers the "best of the best" when it comes to outdoor cooking. We call our grills a "grill", but they are much more than that. Actually, they are a multi-purpose outdoor cooker. Grill, bake, roast, or smoke any food. In reality, a Primo Grill is a grill, an oven, and a smoker all rolled into one "grill". 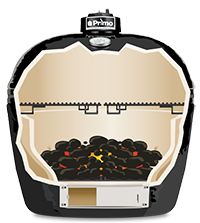 Primo's patented oval shape delivers simultaneous direct and indirect cooking. Grill thick sizzling steaks on the direct side, while roasting farm fresh asparagus on the indirect side. Round ceramic grills promise, but can't deliver the cooking performance of a Primo Oval.